Synthetic peptide, corresponding to a region within amino acids 270-320 of Human SEC13L1 (NP_899195.1). 293T, HeLa, Jurkat, mouse TCMK1 and mouse NIH 3T3 whole cell lysates. ab168824 was affinity purified using an epitope specific to SEC13L1 immobilized on solid support. Our Abpromise guarantee covers the use of ab168824 in the following tested applications. WB 1/2000 - 1/10000. Predicted molecular weight: 35 kDa. Functions as a component of the nuclear pore complex (NPC) and the COPII coat. At the endoplasmic reticulum, SEC13 is involved in the biogenesis of COPII-coated vesicles. Belongs to the WD repeat SEC13 family. Cytoplasmic vesicle > COPII-coated vesicle membrane. Endoplasmic reticulum membrane. Nucleus > nuclear pore complex. In interphase, localizes at both sides of the NPC. It is a constituent of the endoplasmic reticulum and the nuclear pore complex. Functions as a component of the nuclear pore complex (NPC) and the COPII coat. At the endoplasmic reticulum, SEC13 is involved in the biogenesis of COPII-coated vesicles. Cellular location: Cytoplasmic vesicle, Endoplasmic reticulum, Membrane, Nuclear pore complex, Nucleus. 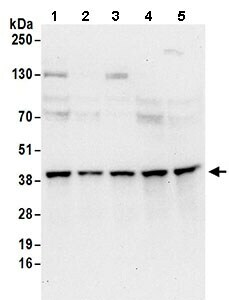 Detection of SEC13L1 in Immunoprecipitates of 293T whole cell lysate (1 mg for IP, 20% of IP loaded) using ab168824 at 6 µg/mg lysate for IP (Lane 1) and at 1 µg/ml for subsequent Western blot detection. Lane 2 represents control IgG IP. Detection: Chemiluminescence with an exposure time of 10 seconds. Publishing research using ab168824? Please let us know so that we can cite the reference in this datasheet. There are currently no Customer reviews or Questions for ab168824.